Also, don't forget to pre-order your Spring Mantra Box®! We only ship 150, and you’ll definitely want to snag this one! I’ve made too much chicken for YBC® as of late. 😏 Time to get into something sweeter and seasonal. Though not a huge dessert person, I’ll never turn down anything fruity or a nice vanilla cake. When the two are combined, it’s even better! ‘Tis the season for rhubarb, and I could not be happier. The extremely tart stalk melds so well with the sweetness of strawberries. It’s no wonder they’ve been a quintessential pairing for so long! Most people think “pie”, and though these two marry well in one, this cake gives it a bit more heartiness while still being - surprisingly - somewhat light and delicate. I adapted this recipe from Strawberry Rhubarb Bundt Cake from Jo-Anna Rooney’s A Pretty Life. I don’t have a Bundt pan, but an angel food cake pan works just as well. Hell, just throw it into a sheet cake pan, it’s all good! As long as that fruit is mingling with the cake in a delicious way, it’s win-win, no matter the shape you bake it in! NOTE: So you don't get ahead of yourself, make the fruit mixture once your cake mixture has been mixed. The fruits - namely the rhubarb - tend to release a lot of their moisture when sitting around in sugar after being chopped up. You don't want the fruit mix to be too soupy before adding it to the batter. 2.) In a large bowl, use a mixer (set to low) to cream together butter and sugar, then add eggs. Mix until combined and lemony yellow in color. 3.) In a separate bowl, sift together flour and baking powder. 5.) Combine the additional dry and wet ingredients to the creamed butter mix; start by adding roughly 1/4 of the dry ingredients & 1/4 of the wet ingredients to the butter mix and beat on low to medium-low. Continue to add dry and wet ingredients in those increments until fully combined. Add vanilla extract to finish off. 6.) Chop rhubarb and strawberries, then combine with cinnamon and sugar in a bowl. Toss to thoroughly coat the fruits. 7.) Grease and generously flour your baking pan of choice; I tested this recipe in both an angel food cake pan and a 13" x 9" cake pan. 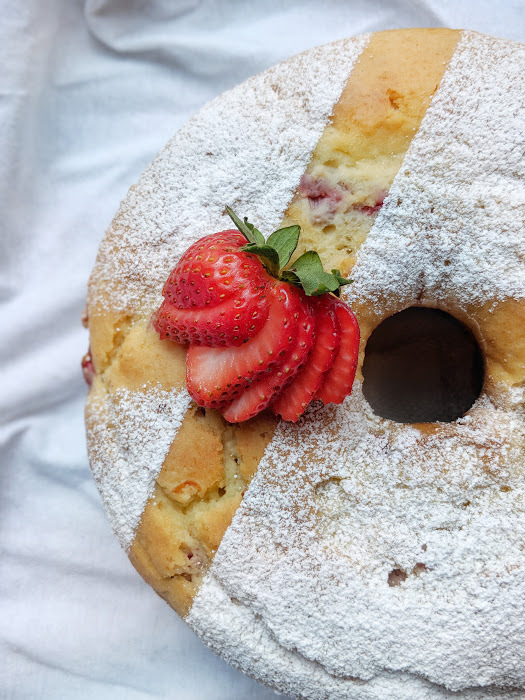 For the angel food or Bundt pan: spoon part of the batter into the bottom of the pan, spoon in and dab fruits on top of batter (do this in a random pattern, so fruit gets dispersed throughout), and repeat this layering process until the batter and fruits are used up! For a sheet pan: spread batter - again, it’ll be a little thicker, then dot fruit mixture around the batter, lightly swirling it in so it gets combined and isn’t sitting directly on top of the batter. 8.) Bake for 45 - 50 minutes if using the angel food cake pan or Bundt pan OR bake for 30 - 35 minutes in a 13" x 9" sheet cake pan. Test doneness by inserting a toothpick and making sure it comes out clean - no huge crumbs or wet batter attached! 9.) If cooking in an angel food cake or Bundt pan, allow to cool for 15 minutes before gently removing. For a sheet cake, I'm the type to just always leave cake in it and eat from the pan. HA! But allow it to cool for at least 15 minutes before attempting to remove it from the pan.